Notre Dame will continue to offer the MS in Patent Law at our campus in South Bend, IN. Faculty from the Certificate and MS program will be available at both events, to talk with you about career options in patent law (have you ever heard of a patent agent?). Of course, food and beverages will be available at both events, too! *224 S. Michigan is the building formerly known as the Santa Fe building, located right across the street from the Art Institute. Patent agents usually work at law firms and at R&D-based companies, where they help inventors protect their inventions by getting patents. Many of our graduates, like Kerisha Bowen, have gone on to work at law firms in major markets. Our graduates are in high demand from law firms across the country. If you or someone you know is interested in learning more about the MSPL, please contact the program Director, Prof. Karen Deak. We will also be hosting an Open House in Chicago on November 7, 2013. *Completed applications, for the purposes of consideration for the tuition discount, include informal transcripts, GRE/LSAT scores, and all required personal statements. 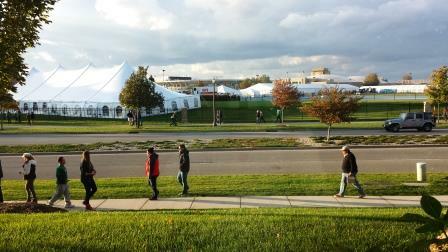 It’s been a quiet week on campus, since it’s been Fall Break! I think everyone has been ready for it, too! I’ve spent my week catching up – doing some writing that I should have done a long time ago about my ideas to move the MS in Patent Law forward; and also taking care of some things at home that I’ve been putting off. Most importantly, I spent this Thursday in Chicago, working on what we’ll be doing there over the next couple of years. Stay tuned for exciting details! Cathi has had a busy week while the students were gone. On Monday she was at the Big 10 Grad Fair at Purdue, and on Thursday she was at Loyola at their graduate fair. She got to meet a bunch of great people, some of whom will hopefully be joining the MS in Patent Law in the next few years. Probably the most exciting thing that happened this week is that we held the first organizing meeting for what Notre Dame will be doing at the 2014 International BIO convention. Again, we have big plans in the works; I’ll keep you updated as those plans come together, too. Today Notre Dame plays USC, in one of the few home night games of our football season. As I’ve written about in earlier posts (here, here, and here), football weekends are great times for networking with alums who are interested in what we’re doing with the MSPL, and in meeting our students. Yesterday we hosted another of our Friday Lunch-and-Learns, in which Stephen Smith, a patent litigator from Quinn Emmanuel (ND ’07), talked about what patent prosecutors can do to make his job as a patent litigator easier (or harder, depending which side he’s on). Stephen’s talk was really engaging, and he included a bunch of practical tips that the MSPL students hopefully will take with them as they write their capstone patent applications. This is Stephen’s second visit to the MSPL – he came last year and was so well-received that we invited him back! I have been working hard today, too. I started the day with a breakfast with someone who I hope will be a new friend to the MSPL. Over lunch, I met with Peter McHugh (ND ? ?, I wouldn’t want to say), who is an attorney for the biotech trade group called BIO. Last year was Notre Dame’s first time participating in BIO in awhile, and we had a really good reception among the biotech community. We are planning an AWESOME event this coming convention, which is June 23, 2014 – June 26, 2014. Stay tuned for details. After that, I was invited to the GE tent. GE has been a strong partner to Notre Dame generally, hiring more than 500 ND grads in the past 10 years or so. GE has also been a strong friend to the MSPL, hosting us at several of their sites last year over spring break (posts here and here). It’s been a great day, and now I’m ready to watch some football. GO IRISH! Launch of our Chicago space! 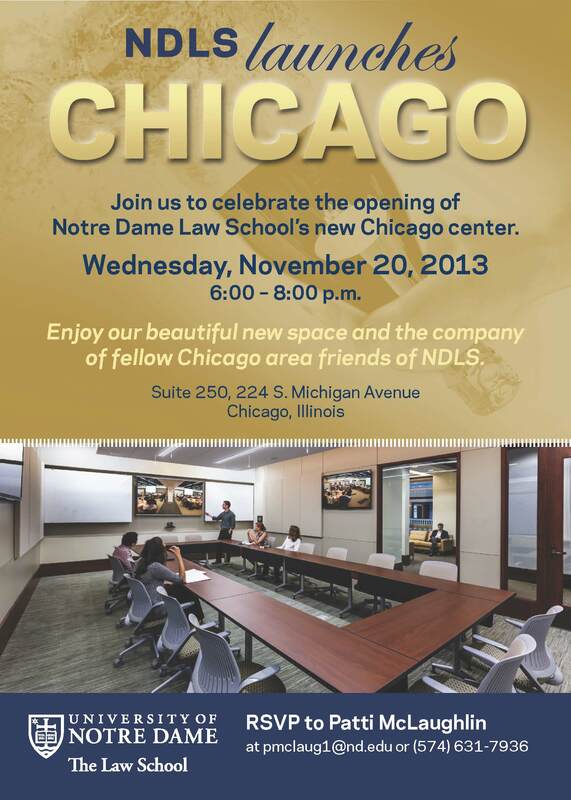 The MS in Patent Law is excited to be a part of the new Law School space in Chicago! Next year, we’ll begin to offer some instruction at 224 S. Michigan Avenue (right across from the Art Institute). Meanwhile, I hope you’ll consider joining us for our launch party on November 20, 2013. From 6-8pm (Chicago time) the space will be open, and you’ll be able to see our state-of-the-art AV, visit the building’s penthouse, and of course, enjoy refreshments. If you are interested in attending, please RSVP to me (kdeak@nd.edu) or Patti McLaughlin (pmclaug1@nd.edu). I hope I see you there! 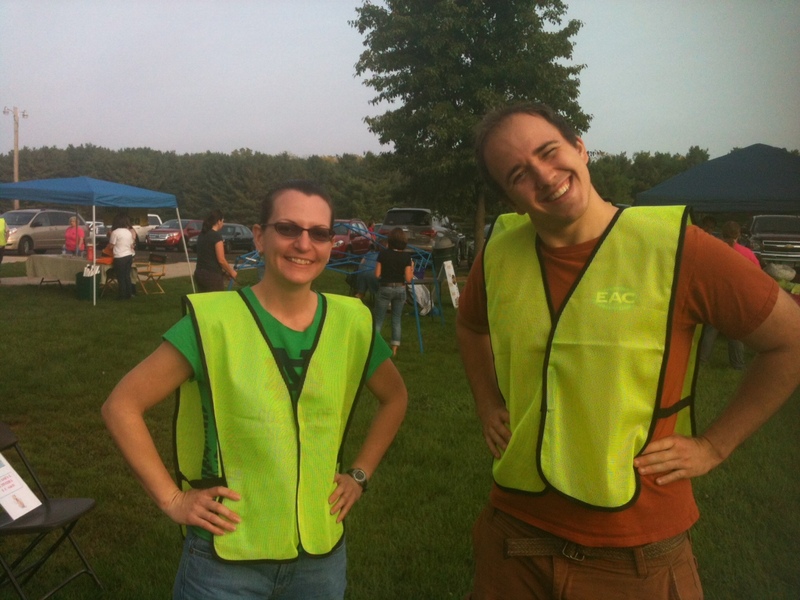 On Saturday, the PATL students had the opportunity to help out Pet Refuge again (see post from Bootcamp week) at the annual Mutt March at St. Pat’s Park in South Bend. There were many cute doggies – some in costume, some doing agility training, some sniffing other dogs. One of the best things was seeing the dogs who had been adopted from Pet Refuge with their fur-ever owners. Some of us helped the doggie marchers and their humans find their way on the trails (if you haven’t been to this beautiful park – go now!). We also helped out at the vendor tables selling all things pet-related. 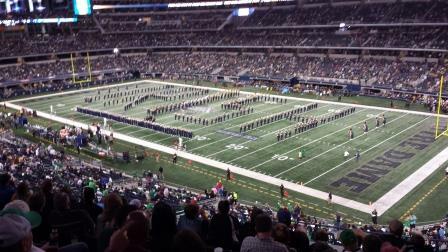 On Saturday, I went to the ND-ASU game. 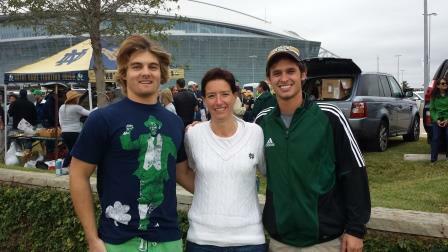 On my way into the stadium, who should I run into but two of last year’s MSPL students – Beau Horner and Kary Yergler!! Beau has recently taken a job in Austin, at a firm called Hulsey and Associates. Kary has just accepted an offer to start in Fish & Richardson’s Dallas office in mid-October. What a great surprise to be able to catch up with the two of them! 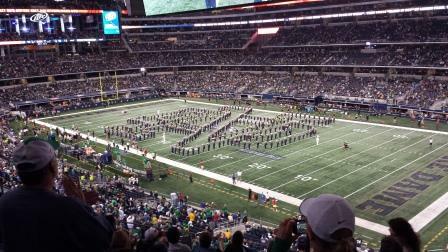 The ND-ASU game was tons of fun — especially because we won!! 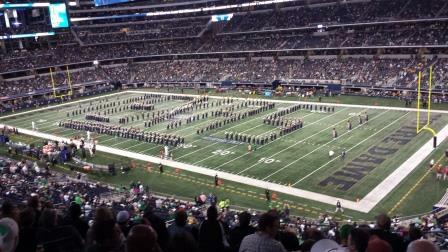 My favorite part of football games is usually the Notre Dame band (because they’re always good! ), and once again they didn’t disappoint. They had prepared a variety of Texas-themed songs and moves. 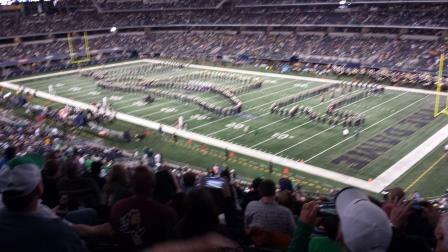 I am about to leave Ft. Worth after a visit to watch the Irish play ASU in AT&T Stadium. I had a great trip! On Friday, I had lunch with Jerry Welch, who is an ND engineering alum; Rob Hanson, who I used to practice with; and a couple of new patent prosecutor friends in Dallas. 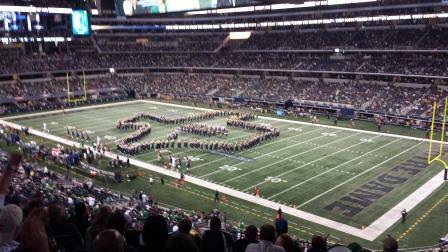 Friday night was the pep rally and then an event for ND alums in the area. 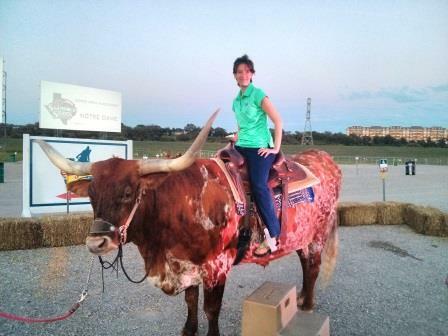 At the alumni event, there was a real steer, which we all got to sit on. Enjoy! I AM ON A COW. You’re welcome! Monday we were fortunate to have a guest lecture from Jack Regan, a partner at WilmerHale. Jack is an ND alum (Government major), and is now a patent litigator – which means he tries patent cases in court in front of a judge and jury. Jack told us about a case he’s currently involved in, which he will shortly argue at the Federal Circuit (where all patent cases go on appeal). Specifically, Jack explained what a Markman hearing is: where a judge decides what the claims in a patent really mean. In the Markman hearing, the two sides argue about what claim terms mean based on how the claims are written and also on the other language in the patent itself. The Markman hearing happens before the “real” trial, and can sometimes decide the case without it ever going to a judge or jury. Jack was in town for the Oklahoma game (enough about football!). Usually we do our Lunch-and-Learns on Football Fridays in the fall, but Jack couldn’t make it to campus on Friday because he was wrapped up with his caseload. It was great to hear from Jack right now, because our students are starting to think about claims for their Capstone technologies, so it was a great opportunity to reinforce that claims need to be clearly and accurately written.